Following the launch of revamped apps for Microsoft News on iOS and Android last week, the software giant has pushed out a new version of the Windows 10 application for testers. 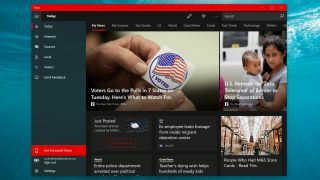 The overhauled News app is now out for Insiders testing Windows 10 preview builds in the fast ring, so once the fine-tuning is done, it’ll be rolling out to the general computing population – and hopefully sooner rather than later. The app sports a fresh look which boasts elements of Microsoft’s Fluent Design interface, the coat of paint the company is gradually applying to entirety of Windows 10. In short, the appearance is much improved, and the software runs along similar lines to the aforementioned News apps on mobile. With the refreshed Microsoft News app, the company is hoping to take on the likes of Google News, with the editor-in-chief of the service, Microsoft’s Rob Bennett, underlining how easy it is for users to personalize their own news experience. That means the ability to prioritize your favorite topics so that the most relevant stories are presented to you upfront, enabling you to create your “own personal newsroom” as we observed last week. It’s good to see the Windows 10 app (hopefully) isn’t too far behind the mobile efforts.